I-Pad is a mini desktop with links to quickly launch programs. It also includes a task manager and terminator, which allows you to terminate programs that is running but not caught by the CTRL+ALT+DEL box. These "hidden" programs can slow your computer down. 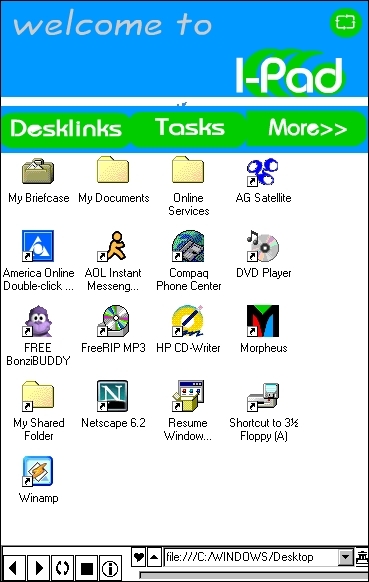 It also have a File Explorer just like windows but unlike windows you can chance the background image on this explorer. Supports plug-ins and skins. Also it include a mini playlist and MP3 Player, so you would get all the essentials in one application. It sits on your system tray and awaits your usage.